Western Caribbean cruises out of Tampa go to the Cayman Islands, Isla Roatan, Belize, Cozumel and other exotic ports. The opportunities for snorkeling are highly rated at every stop. You can visit ancient Mayan ruins or simply soak up the sun on a beach. See the schedule of departures below. Grand Cayman (Cayman Islands) is another port in the Western Caribbean. It's a world financial center with glitzy shopping. This island is also another snorkeling paradise. Swim with stingrays. Relax on Seven Mile Beach. Paddle a kayak. Tour the charming town of George Town. Visit the Turtle Farm interactive sea turtle nursery. Roatan Island is not far off the coast of Honduras. A huge barrier reef lies just offshore, luring snorkeler with colorful coral and amazing marine life. Dive to a shipwreck. Take in the natural beauty of Carambola Botanical Gardens. 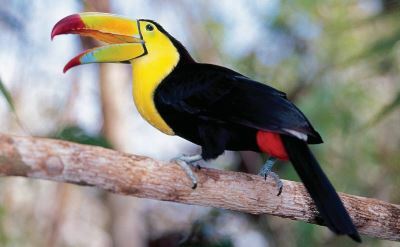 Visit parrots, monkeys and iguana at Gumbalimba Preservation Park. Swoop down a zip line. Cozumel (Mexico) is a popular stop on many Western Caribbean cruises. It is an island that is home to a big underwater reef. Go snorkeling or diving to see tropical fish, turtles and other sea life. Interact with dolphins at Chankanaab National Marine Park. On land, the beach has all the food, drink, and activities you could ask for. Lots of cruise passengers take an excursion to the nearby ancient Mayan city of Tulum, which was at its peak around 1200 A.D.
7-day Western Caribbean cruises on Carnival Cruises. Round-trip from Tampa to Cozumel (Mexico), Belize, Isla Roatan (Honduras) and Grand Cayman (Cayman Islands). • 2019 departures: April 14, 21, 28; May 5, 12, 19, 26; June 2, 9, 16, 23, 30; July 7, 14, 21, 28; August 4, 11, 18, 25. 7-night Western Caribbean cruises on Royal Caribbean. Round-trip from Tampa to Key West (Florida), Cozumel (Mexico), Belize City (Belize) and Puerto Costa Maya (Mexico). 7-night Western Caribbean cruises on Royal Caribbean. Round-trip from Tampa to Puerto Costa Maya (Mexico), Belize City (Belize), Roatan (Honduras) and Cozumel (Mexico). • 2019 departures: April 6, 20. 7-day Western Caribbean cruises on Holland America Line. Round-trip from Tampa to Key West (Florida), Mahogany Bay (Roatan), Santo Tomas de Castilla (Guatemala) and Costa Maya (Mexico). • 2020 departure: January 5; February 2, 23; March 1, 29. 7-day Western Caribbean cruises on Holland America Line. Round-trip from Tampa to Costa Maya (Mexico), Roatan (Honduras), Santo Tomas de Castilla (Guatemala) and Cozumel (Mexico). • 2020 departure: January 26; March 22. 7-day Western Caribbean cruises on Norwegian Cruise Line. Round-trip from Tampa to Costa Maya (Mexico), Harvest Caye (Belize), Roatan (Honduras) and Cozumel (Mexico). 7-day Western Caribbean cruises on Norwegian Cruise Line. Round-trip from Tampa to Cozumel (Mexico), Roatan (Honduras), Harvest Caye (Belize) and Costa Maya (Mexico). • 2020 departures: January 11, 25; February 8, 22; March 7, 21; April 4. 7-night Western Caribbean cruises on Royal Caribbean. Round-trip from Tampa to Key West (Florida), Grand Cayman (Cayman Islands), Cozumel (Mexico) and Puerto Costa Maya (Mexico). • 2020 departures: January 4, 18; February 1, 15, 29; March 14, 28; April 11.